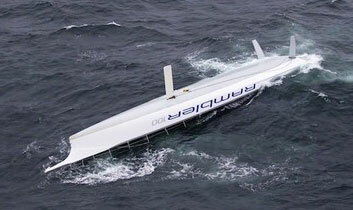 Did you see the astonishing story of the super maxi Rambler 100 losing its keel bulb and turtling in the Fastnet race? This super-high-end sailboat was trying to grab the all-time monohull course record in the race, but wound up turtled instead. And one of the 21 crew members aboard was our October speaker, Peter Isler, who was the boat’s navigator. The magazine reported that five of the crew members had to tread water “for several hours,” but only one of those suffered from hypothermia.